A day after the death of the LA Unified school board’s only African American member, Marguerite LaMotte, community leaders with ties to her south Los Angeles district began speaking out about how to fill the vacancy and who should fill it. 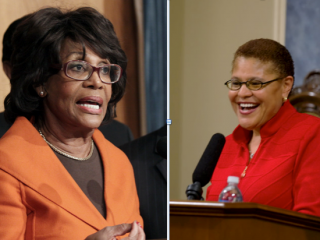 Her colleague, Representative Maxine Waters, says it’s vitally important for the board that her seat continues to be represented by an African-American. While a list of possible candidates is emerging (see below), neither Bass nor Waters would speculate with names. By terms of the LA city charter, the board has two options to fill the seat. It can appoint a replacement to serve through the end of LaMotte’s term, June 30, 2015, or it can work with the city to hold a special election, with the winner serving the same period. District officials were working today to clarify how the process can play out and if the choice is an election, when it could be scheduled. School board District 1, which LaMotte had represented since 2003, includes parts of south LA, Leimert Park and Baldwin Hills. It stretches as far west as Palms, as far north Hancock Park, and south to Gardena. It also includes a cluster of the district’s remaining schools with a majority African-American student body, including Crenshaw, Locke and Dorsey high schools. The seat has been held by a black woman since 1979, when LA Unified first began electing board members by region. While a growing number of community leaders say they would prefer a special election to fill the seat, two sources said other leading figures were letting the district know that they would prefer the board appoint a successor. In either case, Waters says she is getting involved. “I fully intend to be part of the process in helping to get with the community and get behind a candidate that we think would do a great job with it,” she said. According to a source who is not authorized to speak publicly but has a long history of working in south LA, the vacancy has caused a series of high level phone calls among local African-American leaders who want special election rather than a board appointment. Maria Brenes, Executive Director of InnerCity Struggle, is adamant the school board should actively seek the participation of LaMotte’s former constituents. Even at this early juncture, political operatives inside the LA Unified community and outside have begun floating names of possible successors. Alex Johnson — A top aide to LA County Supervisor Mark Ridley-Thomas since 2010, working on education and public safety issues. He is a relative newcomer to Los Angeles, having worked in the General Counsel’s office of the Department of Education in New York. Jimmie Woods-Gray — Just appointed by Mayor Eric Garcetti as a Fire Commissioner, she is a former LA Unified teacher, union activist and chair of the union’s political action committee, who ran for a State Assembly seat in 2012. George McKenna — Long time educator who recently retired. He was the subject of a made- for-TV-movie starring Denzel Washington about the challenges of turning around a school. He has served as a Superintendent of the nearby school districts of Compton and Inglewood. Marqueece Harris-Dawson — A longtime community organizer who is now president of the Community Coalition, a powerful voice in South LA, founded in 1990 by Representative Karen Bass. Amelia Williamson — Until recently, the Interim president of the Magic Johnson Foundation which has been a major player developing community-based organizations and organizations in south LA. Previous Posts: LaMotte was a ‘fierce champion’ for kids in her Los Angeles district; Marguerite LaMotte, Long-Serving Member of LA Unified School Board.